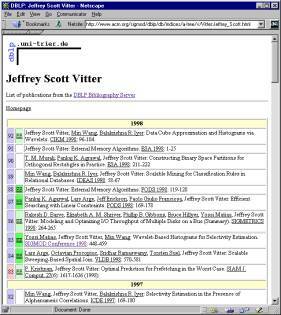 Collect all bibliographic entries from all computer science journals, conferences, workshops, technical bulletins, and books. Provide free searching on the web. Collect keywords, and later, abstracts, for all entries. Copyright restrictions on some abstracts? Start with full text of paper's bibliography. Propose that SIGs collect these. Propose SIGs fund populating full ACM Digital Library. Could go to SGML or XML, 99.9% accuracy: $8-$10 per page. Stage 3: Full Text, cont. This represents 5% of total of 1M papers. ACM books: obtain full text from publishers. Offer full CD Rom package at cost in exchange for inclusion in CD Rom and use of full text for searching. e.g., IEEE ICDE: 600 pages x 17 years x $1.25 = $13K. SIGs pay for integration: $0.25 - $0.50 per page. ACM Computing Portal provides valuable entry into their DL, enhancing their revenue stream. For other books, make same offer. Collect and capture SIG-relevant bibliographic entries, abstracts, and keywords, in appropriate format. Allocate funds to populate the ACM DL: journals, conference and workshop proceedings, SIG newsletter. Provide hardware and software to host CSP. Provide staff to manage CSP, with content provided by SIGs.